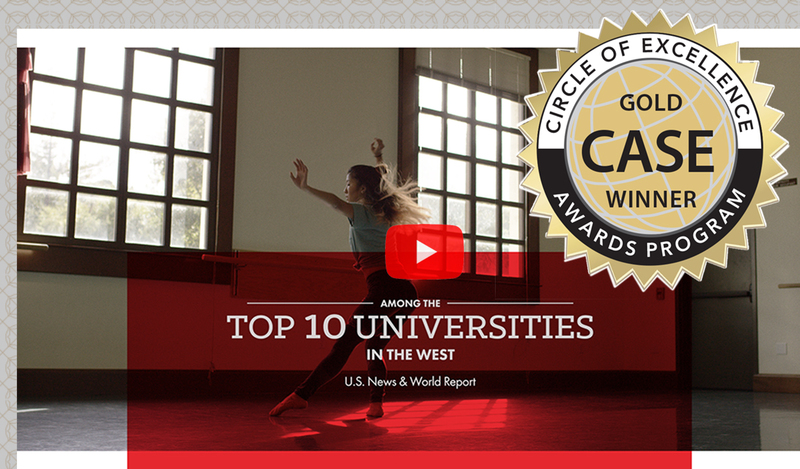 Saint Mary’s College of California has received a prestigious 2018 Circle of Excellence gold award from the Council for Advancement and Support of Education (CASE). The College was recognized for its 30-second institutional commercial A World-Class Education Without The Attitude in the national Circle of Excellence competition. More than 675 higher education institutions, independent schools, and nonprofits worldwide submitted more than 3,200 entries for consideration. A panel of judges selected Saint Mary’s submission as the gold award winner among 47 national entries in the recruitment video category. The national Circle of Excellence awards program recognizes outstanding work in advancement services, alumni relations, communications, and marketing at CASE member institutions. Award submissions are judged by peer professionals at higher education institutions from across the country. The Council for Advancement and Support of Education is one of the largest international associations of education institutions, serving more than 3,700 universities, colleges, school, and related organizations in more than 80 countries. CASE is the leading resource for professional development, information, and standards in the fields of education fundraising, communications, marketing, and alumni relations.